The First Person Shooter (FPS) genre has gone through a seismic shift in the last 18 months with the tired formula replicated by numerous huge brands being unceremoniously dumped in favour of the ‘Battle Royale’ mode. Games such as Fortnight and the newest instalment in the ‘Call Of Duty’ franchise have moved towards huge online multiplayer arenas with up to 100 players all vying to be the last one standing either in individual or team modes. Single player campaigns now seem to be tacked on or abandoned completely as the multiplayer movement grows ever stronger. 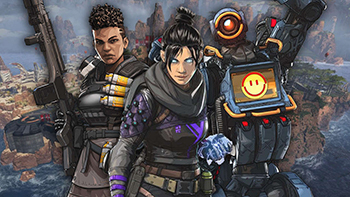 The release of Apex Legends came without much fanfare or build up but due to a few game changing features has quickly grown into a behemoth of the genre. Apex plays like the majority of other games in this genre but seems quicker, slicker and more accessible to the masses. It allows you to play and enjoy immediately but has a very steep learning curve which after a few hours of play, will make you think you are a master worthy of your own Twitch stream. So what is different? Firstly, characters. Most games in this genre will have you suiting up as an unnamed, generic character but Apex lets you choose from a roster of 8 characters (6 to start, 2 more can be unlocked by progression or purchases). Each of the characters has specific special abilities which change over time allowing different combinations of characters within your three man team which in turn allows you and your team to tailor your team to your particular play style. Gameplay is smooth and intuitive with shooting mechanics which are tight without making it easy to hit enemy players. The main difference however is the fact that once you are downed by an enemy, you can be healed by a teammate (as per most FPS titles) however, should you be permanently killed by an enemy before you can be revived, your teammates can still recover your banner and bring you back into the fight at several respawn sites located around the map. Should you be respawned however, ensure you are ready to run as you will respawn without any weapons or armour and will be extremely vulnerable as other teams can see your dropship as you leap back into the fray. Weapons are varied and plentiful around the world, located in buildings, storage bins and from fallen enemies with the collection of items and swapping out of loadouts being easy and intuitive. Ammunition is sparse but once the killing begins, your best source of loot is from fallen enemies, especially as the numbers dwindle. Apex uses a similar ring formula with the playable area of the map shrinking at regular intervals to push the players into an ever smaller ‘killing field’. The game also includes a revolutionary ‘ping’ system which allows you to communicate with teammates quickly and easily without the need to have a headset and microphone. The ‘ping’ system allows you to indicate preferred routes, highlight spotted enemies and even request help getting that tricky mod for your new weapon from your teammates. This system is so intuitive, you will find yourself ‘pinging’ loot for your teammates and tagging those enemies within minutes of your first foray. In conclusion, Apex Legends has taken a new genre, reinvented and added new life into a mode of gameplay which was already in danger of becoming stagnant. Apex has now exceeded over 50 million players in a little over a month since release with no signs of this phenomenal growth slowing anytime soon and with the addition of the monthly battle pass very soon, further customisation and even additional characters will be added to the roster increasing its appeal and replay-ability. Although it still has some way to becoming the king of the genre, it is very quickly making ground on Fortnight which has over 200 million players, showing the potential for just how far this game and its potential sequels could go. In short – download it (it’s free! ), prepare to get shot a lot and enjoy! But it could be a 10 with updates and a battle pass!